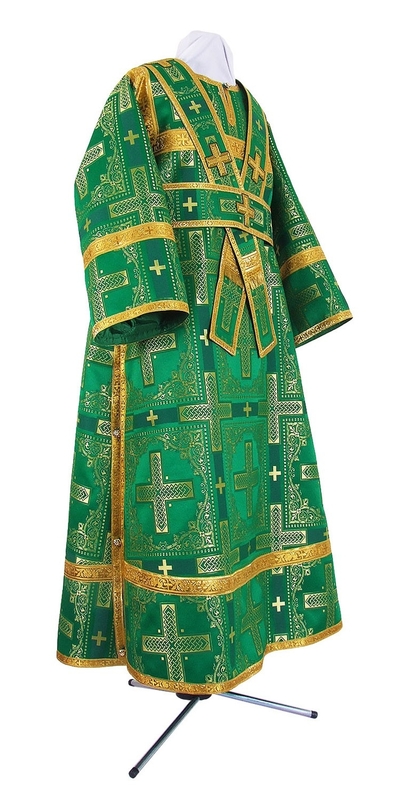 Orthodox Church liturgical Subdeacon clergy vestments (green-gold) by Istok Church Supplies Corp.
Are you searching for high quality sub deacon vestments in green and gold combination? You have come to the right place! Istok Church Supplies carries a broad range of top-of-the-line sub deacon vestments (Green-Gold) that can be customized to your specifications. In Orthodox Christian tradition, green is the color of life. It also symbolizes the Holy Spirit and wood of the Cross. A sub deacon vestment (Green-Gold) is perfect for wear during important occasions such as Palm Sunday, Pentecost and Holy Spirit Day. 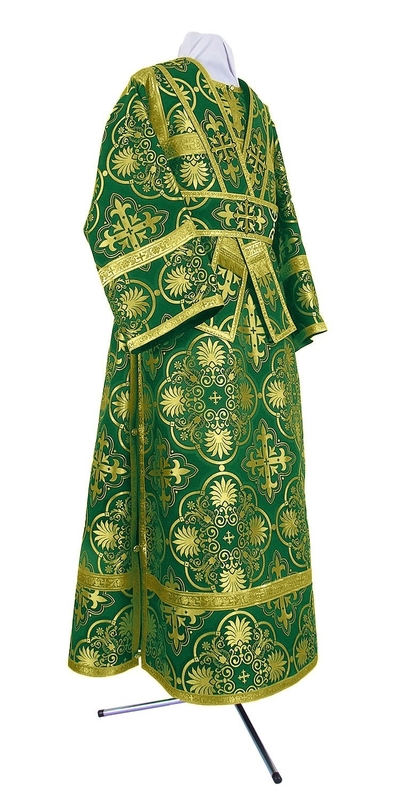 Our green and gold sub deacon vestments are made from quality church fabrics such as rayon brocade and metallic brocade. They feature exquisite designs and patterns that are sure to create a favorable impact on church goers. A sub deacon is required to wear a sticharion and orarion while assisting a Bishop during liturgical services. For this reason, we our sub deacon vestments (Green-Gold) include both these items. Each individual vestment is lined with natural rayon that is provided free of cost. Customers can also add natural velvet inserts to their order. Customers have complete freedom to select fabric and decoration type from given options. Our experienced ecclesiastical tailors will keep your preferences in mind while constructing your made-to-measure vestment with care for quality, traditions and workmanship. While you may not be able to touch and feel the vestment as you would in a physical store, we do provide a superior browsing experience to help you make good purchase decisions. You can zoom into the image provided with each individual product listing to get a good view and go through the product description to have all the information you need at your fingertips. A few clicks of the mouse and you can place your order with complete ease. Discounted prices and multiple secure payment channels make online purchasing at Istok Church Supplies an absolute joy. We ship worldwide - so explore our collection and place your order at the earliest!